More than 1.200 workers at Lanaras factories demonstrated to the ministry of economics, when they were attacked by riot cops. 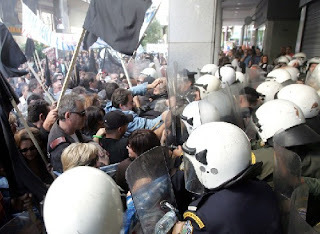 According to the media "tension started when entrance was denied to the representatives of the workers, and granted only to the president of GSEE (umbrella association for workers unions) and to the parliament member T. Sidiropoulos". The management of Lanaras enterprises tries to roll on to the state the payment of salaries of previous months the workers have worked for, and also funding for the continuation of the factories' function, something that is opposed to the E.U. commission orders.